What is in the pot is actually what was left after we ate dinner. We didn't use uncooked shrimp. We thawed pre-cooked shrimp and stirred them in at the very end to warm them up but not make them tough/rubbery. We used only enough shrimp for one meal at a time. 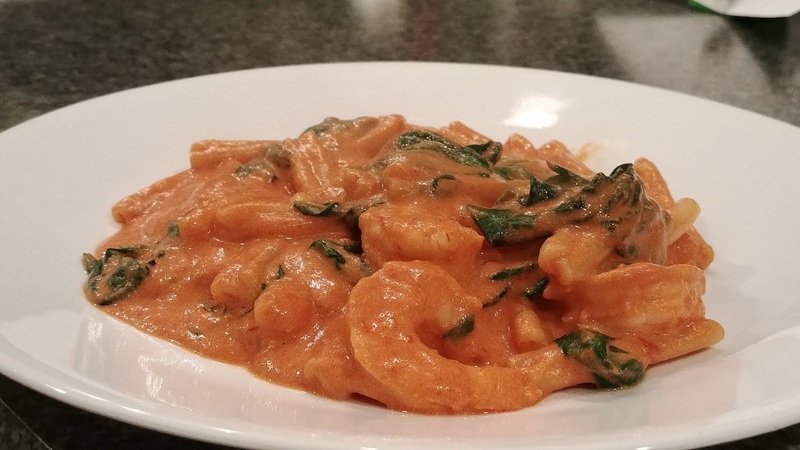 When we re-heated the leftovers, we warmed them in the oven then stirred in thawed shrimp and let it warm another 5-10 minutes. It's really tasty. 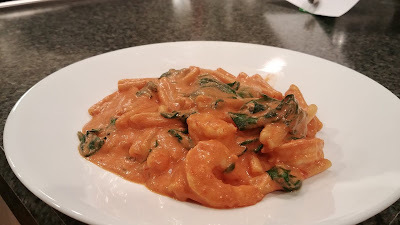 The pureed roasted red pepper adds a really nice flavor to the tomato-cream sauce. This would be good with chicken, too. You could add some garlic and/or onion if you wanted. We'll definitely make this dish again. Cook pasta according to package instructions, set aside. 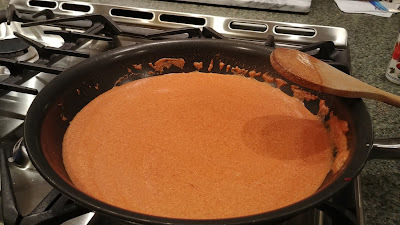 In medium size pan on medium to low heat, combine milk, cream, pureed roasted red pepper, tomato paste. Season with salt and pepper. 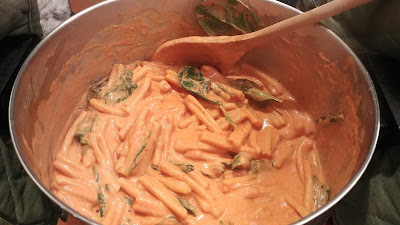 Once combined and heated through, combine sauce & pasta in pasta pot (or in sauce skillet). Add spinach. Toss to mix in/wilt spinach. Add shrimp/chicken, if desired. Serve. *We didn't use a full 16 oz package of pasta because we would have had too much food for the week. 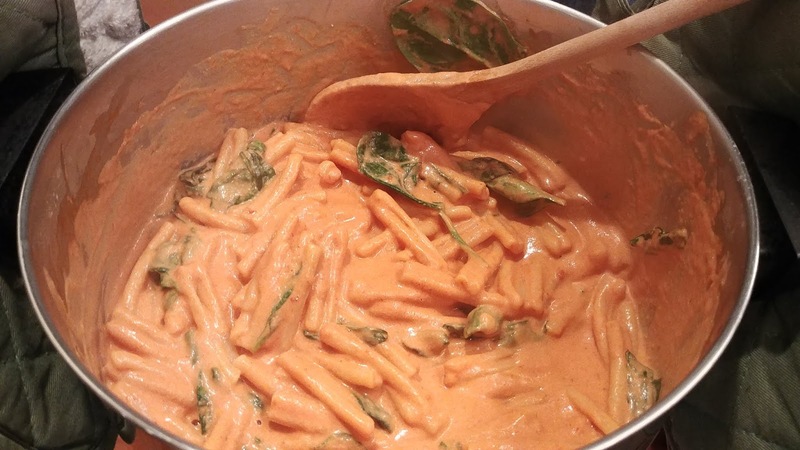 Ours was saucier looking than in the inspiration post because we used less pasta. You could use a whole 16 oz package and the same amounts for the sauce or make another half batch of sauce. 10-11 oz pasta usually gives us 2 dinners/4 servings while 16 oz usually gives us 3 dinners/6 servings depending on what else is in the pasta dish/what we're eating with the pasta. **For sprinkling on top. We didn't feel like grating cheese, so we didn't use parmesan sprinkle. I didn't miss it.